Hanoi (VNS/VNA) - Vietnamese marksmen set a relatively modest goal of earning three gold medals at the upcoming Southeast Asian (SEA) Games in Malaysia. “The 2017 Games will be a difficult event for us, as the hosts [Malaysia] cut all team events, which are a strong point of Vietnam. As usual, Vietnamese best shooter Hoang Xuan Vinh will compete in three or four categories. However, in this Games, one of Vinh’s key events, centre-fire pistol, has also been removed. So Vietnam team only target three golds. If the team can do that, it is a success,’ said head coach Nguyen Thi Nhung. At the 28th Games held in Singapore two years ago, Vietnamese shooters contributed 11 golds to Vietnam’s medal count. Vietnam will send 23 shooters competing in 11 out of 14 divisions. Among three gold medals which Vietnam aim to grab, Vinh is expected to take two. The remaining gold is for Nguyen Xuan Chuyen, Phan Công Minh or Bui Hong Phong. According to the International Shooting Sport Federation rankings, Olympic Rio 2016 gold medalist Vinh still leads the men’s 10m air pistol, while in the 50m air pistol he ranks second after Jin Jongoh from the Republic of Korea. However, Nhung said Vinh’s glory at the Olympics doesn’t ensure that he will earn gold at the regional sports festival, as the shooting’s result depends on many factors. “Each event has different features. Vinh’s Olympic gold medal doesn’t guarantee that he can maintain his elite performance in the regional tournament. His biggest difficulty is ability of focus and pressure following his achievements in Brazil Olympic,” Nhung said. Vinh also admitted that “many people ask me if I met pressures when competing in other tournaments after winning an Olympic gold? I answered yes. But in fact, pressure is a normal thing for athletes like me. If athletes want to win, they are forced to overcome it,” said Vinh. Early this year, Vietnamese marksmen competed in the World Shooting Championships in India. Vinh from the Military team snatched a silver medal in the 10m air pistol. 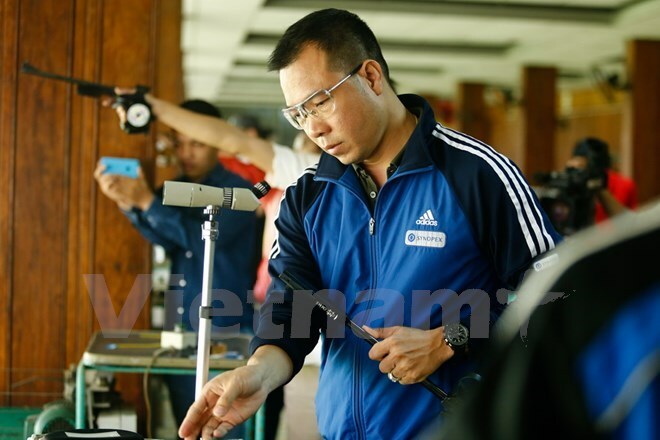 In the National Shooting Cup in April, the 42-year-old Vinh won four gold medals. In the list of shooters competing in Malaysia, Iwaki Ai, 17, is a special talent. A young shooter of both Vietnamese and Japanese blood, she excels in the 10m air rifle event. Ai is seen as one of the brightest young shooting talents in Vietnam. She won a number of impressive achievements so far in national and international events after completing nearly three years of shooting training. For instance, she won bronze at the Asian Shooting Championships in Kuwait at the age of 15. “Ai has made great advances via each tournament. She is a top prospect for the near future,” head coach Nhung said.